Stalking has moved from being a novel area for study to become a core area of concern for mental health professionals, lawyers and other members of the criminal justice system. It has emerged as a significant social problem which not only commands considerable public attention but is now, in many jurisdictions, a specific form of criminal offence. 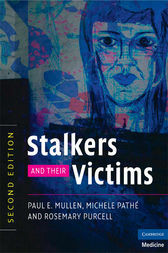 This new edition brings the reader completely up-to-date with the explosion in published research and clinical studies in the field, and covers new issues such as cyberstalking, stalking health professionals, stalking in the workplace, female stalkers, juvenile stalkers, stalking celebrities, evaluating risk in the stalking situation, as well as exploring changes to the legal status of the behaviour. Illustrated with case studies throughout, this is the definitive guide and reference for anyone with professional, academic or other interests in this complex behaviour.